This beautiful I-10 West property offers King singles and Queen doubles in all standard rooms. It also offers full separate living and bedroom area suites. Luxurious rooms with personal whirlpool/jacuzzi and sofa sleepers are also available. 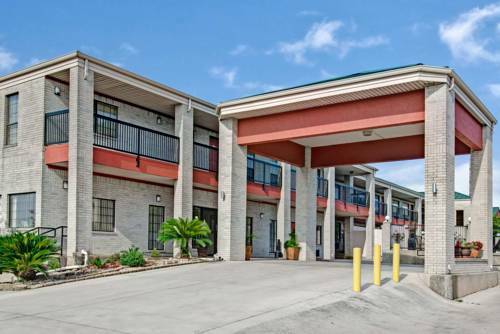 Amenities include FREE hot breakfast, FREE Wireless High Speed Internet, coin laundry facilities, fax and copy service, meeting room, and outdoor swimming pool. Microwave/mini-fridges are available in all rooms. Six Flags Fiesta Park, South West Medical Center, USAA, Baxter Pharmaceuticals, Diamond Shamrock Corp., Bank One Corp., Nations Bank Corp., Clarke-American, and Raquetball Fitness Club less than 5 minutes. Sea World and Alamo downtown within 15 minutes. Fine entertainment, wining and dining nearby.